Need help calming your mind, reducing stress, or easing nagging fatigue? Try child’s pose. This is a true resting posture that can be held for long periods of time without the need for props. Begin on all fours and start by spreading your knees wide apart while keeping your big toes together. Drop your buttocks back onto your heels and sit tall while lengthening your spine. Bow forward so that your heart and chest drop between or on top of your thighs. The forehead will come to rest on the floor. Extended your arms out and away from the crown of the head and press the palms down into the floor. Find length in the sides of the body while letting your upper back broaden. 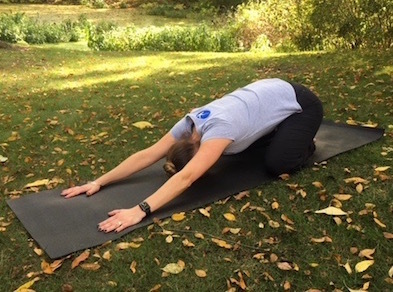 Breathe into your lower back and let tension be released from your shoulders, arms, and neck. There is an inward fold of the body with the eyes looking back towards you. This sends a signal to your brain that you are safe and that it is okay to rest. Hold for up to a minute or longer while breathing softly. This will calm the mind and rest the body. Although this is a gentle pose with many benefits please be mindful of a few contraindications. If you are pregnant then you must open the knees so that no pressure is placed on the abdomen. Also if you have recently injured your knees or ankles then do not practice child’s pose. It is always important to honor your body and work within a safe range of motion, limits, and abilities.